You see a lot of posts these days warning about the ‘Robot revolution’ and about how Robots will be replacing the jobs of many people in the future. Without sounding too crude or controversial, I would ask: Why is this so bad after all? That’s what they are here for, isn’t it? The jobs that fall into the 3 ‘Ds’ category (i.e. Dangerous, Dull, Dirty) are not exactly the jobs we want people doing in the first place, right? I don’t want to get into a moralistic or ethical debate here; nor do I want to set in motion the pendulum of either Utopian or Dystopian thinking. All I want to point out is that, yes of course, you can bet 100% on the fact that Robots will become more prevalent in all facets of our lives in the future. That means, naturally, certain jobs will be handled purely by the robotic systems designed for those 3D implementations and as a result: Certain jobs will soon become ‘too laborious’ for Homo Sapiens and hence, obsolete. Here, it is the balance of the Project ‘Iron Triangle’ that’s in play. The three triangle edges being Cost, Time and Scope (with Quality considered as the middle factor). It simply will not be cost-effective, nor time-effective nor logical for humans to be asked to do these 3D jobs any longer when the risky jobs could be handled more effectively, cheaply and safely by Robots, resulting in even more consistent, if not greater quality. Thinking of the Project or Product Triangle, it’s just a “win-win-win” situation. For the sake of time and cost argument, Karel Čapek (in his play RUR) had set in roughly a ‘near plausible’ future (1950s or 1960s) and his ‘robots’ were inexpensive and abundant everywhere. Consequently, they were irreplaceable as they made products of equal quality for a fifth of the cost that humans did and with less errors and waste. It’s interesting that on the one hand we don’t like the idea of humans slaving away on menial tasks, but on the other, some are ‘scared’ or ‘scare mongering’ that “Robots are going to take over the world.” That’s true – they will. The dirty, dangerous and dull part of the world. Let them have it, I say. That’s the very point. But it’s a negative spin to say Robots will “take away our jobs.” Why? Well, I for one am lazy and, sadly perhaps, I see the human race as a ‘work- avoidance prone’ one. However, we are definitely not tool- or machine-averse. You might even argue that it’s our ability to use technology to make useful tools, solutions and applications that got us this far, wherever that may be. So enter our positive obsession with ‘the robot.’ They will not ‘take over’ the jobs but ‘handle’ the jobs that we ‘choose’ to leave to them. Is that a threat? I do not think so. In fact, by doing so, we’ll get to focus on less 3D jobs and more ‘interesting’ jobs. Perhaps robots will free the time for plenty of other more useful or even more productive jobs for us to consider. Like, perhaps, devising ways of generating new fuel supplies, transport methods, medicines, etc. leading to less conflict and misunderstandings. Perhaps more time for education for all. As we will have more of the population educated and more ‘free time’ to do many other things we couldn’t explore before, perhaps our new inventions and new technologies will even make the Robots that ‘took our jobs’ look primitive. Also, interesting to note is that the epistemology of the word ‘Robot’ can possibly be linked to the word ‘Slave’ in its origins. The term ‘robota’ in Czech translates to something similar to ‘serf laborer’ (in the medieval sense) and could have been derived from a Slavic word ‘rab,’ meaning ‘slave.’ This is a bit of a stretch, however it’s true that Czech playwright, dramatist, essayist, publisher, literary reviewer, and art critic Karel Čapek / 1890-1938, is said to have ‘introduced’ the term ‘Robot’ to English-speaking audiences (Some quote Karel saying that, in fact, it was his brother Josef who inspired him); so, it is no stretch to state that Karel’s Theatre piece called ‘RUR,’ which premiered in 1921 introduced the term ‘Robot’ to a larger public. 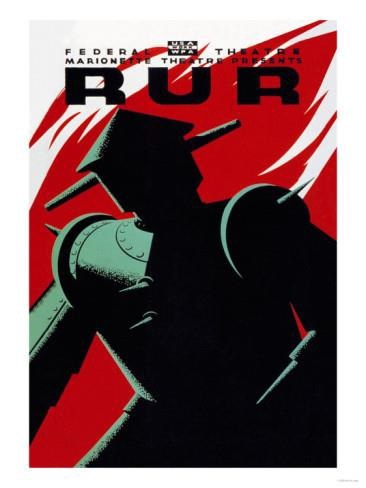 RUR stood for ‘Rosumovi Univerzální Roboti’ or ‘Rossum’s Universal Robots.’ The Robots, the Negative spin doctors talk of, are renegade robot revolution machines crazed to destroy us. But perhaps Robots and ‘Robot Friendly’ Humans could be given a chance to project Robots not as ‘slaves’ but as ‘efficient’ if not sometimes ‘wondrous’ allies or ‘colleagues’ in our workforce and even social lives. Take the Robot bowling anyone? Watch this space! Part 2 will be published tomorrow …. I enjoyed reading your article. And support your angle on the robot discussion. However I am missing an important part of which I am curious whether you will cover it tomorrow: You have not once mentioned the difference between automation of physical work (what your article is about) and the place artificial intelligence currently occupies and more and more will occupy in human-computer-interaction everywhere in society. Many people are not afraid of robots violently taking over the world, but more so of the less and less “human” touch that the systems they interact with have. Especially elderly people don’t enjoy interacting with machines or artificial intelligence, whereas the younger generations are used to it. Still, some emotional tasks should perhaps be left to humans? Or if performed by robots, should they be made to mimic human behaviour, or rather made to be artificial, since they are? I’m curious about your view on this. Thanks for comment and pleased you liked the article thus far. You are right the part that you say is “missing” is indeed not explicitly handled per se in the blog, but I am pretty sure it’s handled in a peripheral way (or at least implied) however. The focus on the comparison or contrast of the impact of the A.I vs. Physical aspects that Robotics and what that will mean for persons that may be less adaptive to robotic interaction is a good point and so let this feedback help address it further please. Alan Turing handled this item also peripherally a while ago in roughly 1950 in a direct manner with his (in)famous “Turing” test. The later CAPTCHA test proved even then that the real trick will be to allow the interaction to be such that the difference between a robot and a human will one day become nearly indiscernible – albeit not necessarily face to face. Your point about the generational gap responses to potential future Robot technology (at least here you mean social robotics I presume) is a good one and I dare say shows that oyu yourself ( as musician?) also take this stance if not as “advocate of the devil” to plea for the need not to lose the “human touch” – but what my article was focusing on was more the fact that robots will replace humans for more the dirty, dangerous and dull jobs – so I do not think robotics will ever replace certain human interactions. Furthermore, about the age related impact t reactions oto technology, it might be worth noting that when the robotics reaches the maturity we anticipate – the persons interacting with these more advanced robotics systems of the future will before the already It savvy or “digital natives” types we see today. I don’t presume that we will not even increase life expectancy in the coming years – but I don’t think the adaption of robotics for the elderly will be a show stopper. That may seem disrespectful of our elderly but it is simply the case. The robotic future is for the persons who will desire and adjust to it and the persons able to adapt and change and embrace robot technology from the start will be positioned best to accept its benefits and utilize robotics to “serve” humanity and not replace it. So, at the risk of sounding hypocritical to some – yes – I of course would think that some “emotional” tasks might best be handled to humans but “left” to them? I am not sure. I think it will become an individual choice. What emotional tasks would be “Robot forbidden”? Let’s take an example you seem familiar with. Music perhaps? I see your point on this for sure. But take it another way. Ever seen the “robot band”? Strange thing is that we can enjoy that “emotionless” created music in an “emotional” way. I prefer a human pianist myself, but the mechanical almost robotic “player piano” was already invented back in the late 19th century for a reason and I for one would rather watch the Robot Band play songs than watching a Human DJ spin records… What do you think? So Dirk, thanks for your observations and relevant questions and I hope we addressed some of these points you correctly identified as “missing”. Kind regards back to you.